It's hard to decide on a title for Ian Barry. After walking through his studio, an industrial menagerie of slick metal slabs and motorcycle parts, a few words pop to mind: engineer, mechanic, artist, sculptor, scientist of metal, visionary. The 40-year-old co-founder of Falcon Motorcycles builds custom British bikes. He takes the word “custom” seriously. Excluding the tires, carburetor, and engine, Barry creates every single part from scratch, even fashioning the tools he needs to form certain pieces. Barry is working on “The Falcon Ten” collection, the goal of which is to develop ten bikes in ten years. He has completed three: the Bullet in 2008, the Kestrel in 2010, and the Black in 2011. He’s currently working on the White. 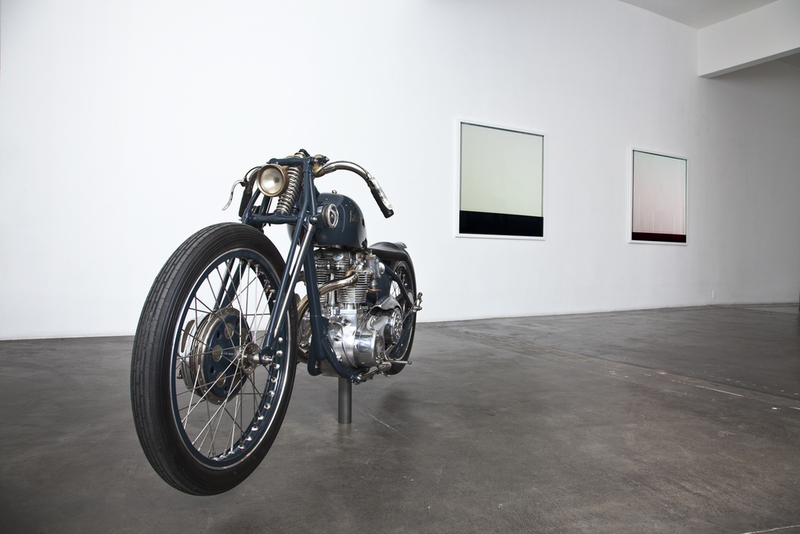 The first two bikes, two earlier works, and drawings of his original concepts will be on display at the Michael Kohn Gallery for The White, The Black, The Kestral, an exhibition that opens July 27 and runs through August 31. The Bullet boasts a 1950 Triumph Thunderbird engine, the Kestrel a modified 1970 Triumph Bonneville, and the Black a 1952 Vincent Black Shadow—each of which is rare and iconic. From there, Barry lets his mind, and his hands, invent the rest. The final product is a mind-bending hybrid of machinery and artistry. I'm the last person to be impressed by the aesthetics of a motorcycle, but I'm completely enamored with the Kestrel. My eyes start at the bottom and latch onto each individual element for minutes at a time. It looks as though it's made of liquid metal; maybe the mercury-like material will swallow my fingers if I sneak a touch. Although the bike is unmoving, you can feel its potential power. “I look at these bikes," Barry says, "and I think: It’s the only way to describe flight on the ground.